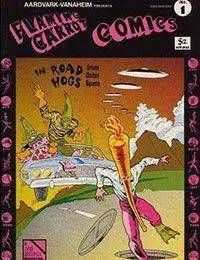 Flaming Carrot, a magnificent creation of the legendary man known as Bob Burden is best renown for his solo series, Flaming Carrot Comics which was first published by Aardvark-Vanaheim. Of course like all good things, things wouldnt last and after a five issue run the title was given to Renegade (Flaming Carrot Comics) and despite that previous insinuation at the beginning of this sentence the series was as good as ever, continuing all the way up until the seventeenth issue. Finally it made its final transition of publishers unto Dark Horse (Flaming Carrot Comics) where it remained until its thirty-first issue. The series was partially collected by Dark Horse (Flaming Carrot Comics Collected Album) and spawned an annual (Flaming Carrot Comics Annual) and later a special, Flaming Carrot Comics Special by Image (under their Desperado imprint) who now have the rights of the comic.